WASHINGTON - Democrats have seized on an unusual wrinkle in special counsel Robert Mueller's investigation of President Donald Trump and Russian interference in the 2016 campaign to accuse the Justice Department of bias, while Republicans suggest that the president is owed an apology. Attorney General William Barr issued a four-page letter Sunday that detailed the findings from Mueller's nearly two-year investigation. They seemed to dispel the cloud of conspiracy that has hung over the administration since its inception. But by delivering caveats alongside conclusions, the closing of Mueller's investigation opens the door to fiercer political fights over the president's judgment and power. Unexpectedly, Mueller's report did not reach a conclusion about whether the president had tried to obstruct justice - a central question of the special counsel's work. Instead, the report laid out the facts and the law on the issue, and made no prosecutorial determination. Barr and Deputy Attorney General Rod Rosenstein then examined the issue and determined the president's conduct did not rise to the level of criminal behavior. A Justice Department official, speaking on condition of anonymity to discuss sensitive details of an investigation, said Monday that Mueller's decision not to make a definitive recommendation on a criminal obstruction case was his "entirely" - not driven by any pressure from Barr or Rosenstein. During a briefing at the Justice Department about three weeks ago, Mueller and his team informed Barr and Rosenstein that the special counsel’s office would not be reaching a conclusion on that question, according to a person familiar with the matter. The development was “unexpected,” the person said. A different person familiar with the matter said the obstruction case was always "the most difficult element" for Mueller's team because demonstrating a person's intent is one of the toughest assignments for federal prosecutors, and the person under scrutiny was the president of the United States. His actions, the person said, have far different legal meaning and repercussions because of his office and the constitutional protections and powers that come with it. 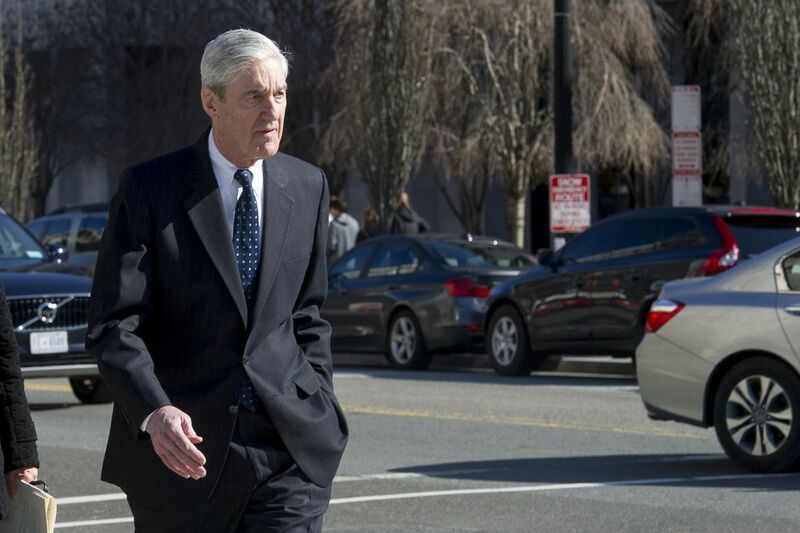 The person said the special counsel's team discussed extensively whether to subpoena Trump, with the office's top lawyers, including Michael Dreeben, James Quarles, Aaron Zebley and Mueller most engaged in the discussions. Those talks centered around whether it was legally feasible, and what the potential costs of a subpoena might be to the overall investigation. The special counsel team went back and forth with Trump's representatives, through multiple iterations of the president's legal team. They were hopeful, the person said, that Trump would sit down voluntarily but mindful that they could not explicitly threaten a subpoena unless they were prepared to issue one. Rudy Giuliani, Trump's personal lawyer, tweeted overnight that Barr's letter marked a turning point for the country. "If Democrats who went too far in their partisan and false claims of collusion can step back and admit their mistakes, we can heal," he said. Giuliani also accused cable news channels of having overreacted to the investigation, and suggested that House Intelligence Committee Chairman Adam Schiff of California and other Democrats should apologize "for their now false claims of collusion." 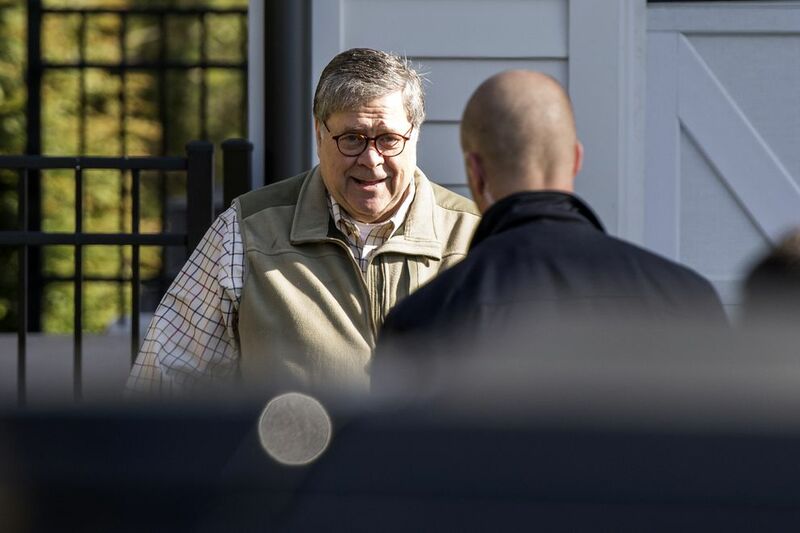 Democrats accused Barr of allowing bias to influence the outcome, alluding to past opinion pieces and a private memo he wrote before becoming attorney general in which he criticized aspects of the special counsel investigation. Hours before the report was released, House Judiciary Chairman Jerrold Nadler, D-N.Y., told CNN: "Obviously, we know there was some collusion." After the release, Nadler tweeted that he wanted Barr to testify before Congress soon to explain what the lawmaker called "very concerning discrepancies and final decision-making at the Justice Department following the Special Counsel report." Trump immediately declared that he had been cleared of all wrongdoing. "After a long look, after a long investigation, after so many people have been so badly hurt, after not looking at the other side, where a lot of bad things happened, a lot of horrible things happened for our country, it was just announced there was no collusion with Russia," the president said at a Florida airport, calling the findings "a complete and total exoneration." Barr's summary said: "The Special Counsel's investigation did not find that the Trump campaign or anyone associated with it conspired or coordinated with Russia in its efforts to influence the 2016 U.S. presidential election." The letter noted that Mueller's inquiry said that no such conspiracy was found "despite multiple offers from Russia-affiliated individuals to assist the Trump campaign." Barr said he and Justice Department officials separately determined that there was insufficient evidence to accuse the president of obstruction - although Mueller was not definitive on that point. "The Special Counsel states that 'while this report does not conclude that the President committed a crime, it also does not exonerate him,' " the letter says, signaling that Mueller's team apparently struggled with the issue. Mueller's decision not to conclude whether the president tried to obstruct justice struck a discordant note with current and former law enforcement officials, who said that was one of the primary reasons for appointing a special counsel. "I think courageous people have the courage to make decisions, and those who don't punt decisions," said George Terwilliger, a former deputy attorney general who worked in the George H.W. Bush administration with Mueller and Barr. Mueller "ultimately determined not to make a traditional prosecutorial judgment" on the question of obstruction, Barr wrote. He and Rosenstein "concluded that the evidence developed during the special counsel's investigation is not sufficient to establish that the President committed an obstruction of justice offense. Our determination was made without regard to, and is not based on, the constitutional considerations that surround the indictment and criminal prosecution of a sitting president," Barr wrote. Barr further explained that decision by writing that "the report identifies no actions that, in our judgment, constitute obstructive conduct, had a nexus to a pending or contemplated proceeding, and were done with corrupt intent, each of which, under the Department's principles of federal prosecution guiding charging decisions, would need to be proven beyond a reasonable doubt to establish an obstruction of justice offense." 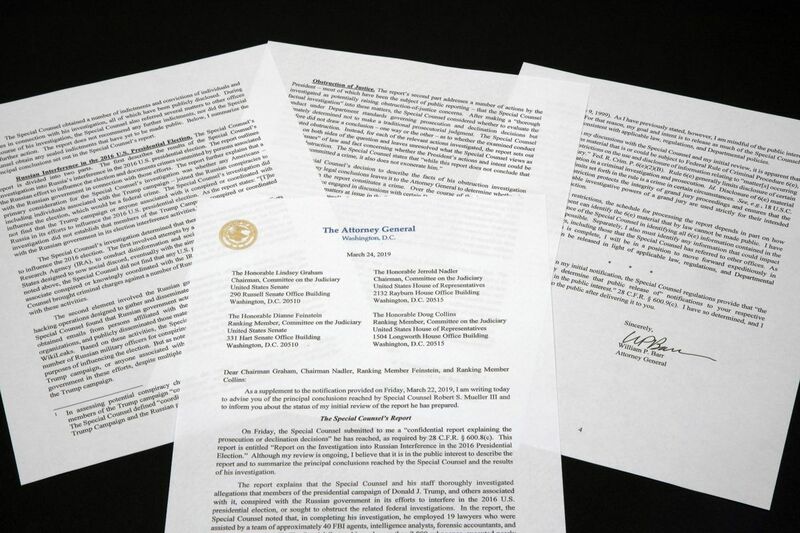 The letter does not make clear whether Mueller asked Barr and Rosenstein to make a final determination on the question of obstruction. "Over the course of the investigation, the Special Counsel's office engaged in discussions with certain Department officials regarding many of the legal and factual matters at issue in the Special Counsel's obstruction investigation," it says. Trump's lawyers seized on a portion of the letter that said Mueller recognized that "the evidence does not establish that the President was involved in an underlying crime related to Russian election interference." That is not necessary to charge the crime of obstruction, Barr noted, but he added, "The absence of such evidence bears upon the President's intent with respect to obstruction." The attorney general said his "goal and intent is to release as much of the Special Counsel's report as I can consistent with applicable law, regulations, and Department policies."